David Beckham may have left Manchester United in 2003 but it appears his hatred for bitter rivals Liverpool still runs deep. 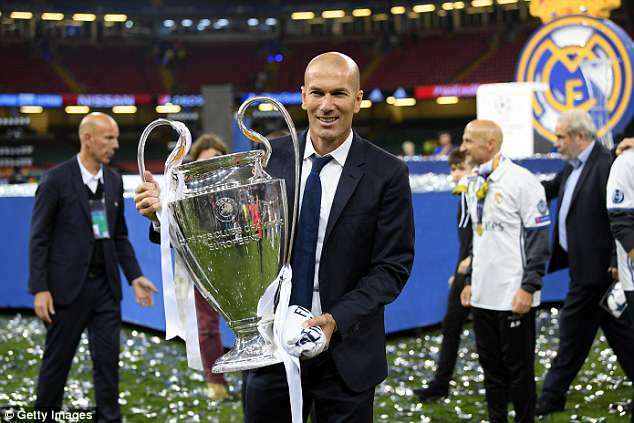 The former England captain has begged ex-Real Madrid team-mate Zinedine Zidane to beat the Reds in the Champions League final on Saturday night. Beckham, who left Old Trafford for Los Blancos in a deal worth £25million, sat down for an interview with Zidane ahead of the showpiece in Kiev and implored him to lift the trophy at Liverpool’s expense. ‘To have been successful as a player and now to be successful as the boss, the big boss, is incredible,’ Beckham said to Zidane. ‘I just want to wish Zizou, the boss, the president, the club good luck in the Champions League final. Real Madrid are attempting to win a third consecutive Champions League title in Kiev and the Frenchman insisted his team have worked tirelessly to get there. Zidane added: ‘We suffered and worked a lot to make it to the final. ‘There has been a lot of sacrifices, a lot of work, a lot of personal investment from everyone.